Deep hole drilling is a metalworking process performed by precision machine tools. Many standard terms used in manufacturing technology apply, however there are some specialized terms and acronyms unique to deep hole drilling that may not be immediately understood without some explanation. Below is a brief Glossary of Terms that are useful when working with deep hole drilling applications. A tool which is used to machine an internal profile within the length of a bore, by using a cutting insert which is extended and retracted with CNC capabilities on a BTA equipped deep hole drilling machine. A tool used to finish a profile into the base of a blind hole, often to forms such as radii, steps, and flat bottoms, and used on a BTA equipped deep hole drilling machine. A tool that is used to enlarge existing holes by removing stock for a larger inside diameter, which is used on a BTA equipped deep hole drilling machine. An operating mode of drilling for cylindrical parts, where the workpiece rotates in the opposite direction of a tool, which is also rotating, in order to improve concentricity of the hole. An extension of deep hole drilling that creates machined features inside deep holes. Counter-boring, bottom forming, and bottle boring are common methods of deep hole machining. A mathematical ratio of a hole depth (D), relative to the hole diameter (d). This ratio determines what holes qualify as deep holes, typically 10:1 and greater. A term referring to the Double Tube System, previously used by the tooling manufacturer Sandvik. A gundrill tip configuration in which distinct geometric features are ground to create the cutting edge, chip clearance and coolant relief. These features (facets) are adjusted as needed for different materials and applications and can be repeated for production drilling. An alternate term for a whip guide insert, commonly used in the deep hole drilling industry. A component mounted to a BTA machine to introduce cutting fluid to the drilling process, and precisely locate the drill bushing to the drilled hole entrance, while providing a seal around the drill tube. Rotating pressure heads act as a tailstock to support a cylindrical workpiece, and have precision bearings and seals that contain the pressurized cutting fluid. A tool that is used to enlarge existing holes with exceptional straightness, by being pulled back through the starting hole on a tensioned bar. Pull boring is a form of counter boring. A device mounted to the rear of a gundrilling spindle, used to introduce cutting fluid to a rotating tool from non-rotating fluid plumbing. An alternate term for gundrilling, Single-Lip Drilling refers to the mechanism by which these tools cut metal in deep holes – with one single effective cutting edge. An alternate term for the BTA system, previously used by tooling manufacturer Sandvik. 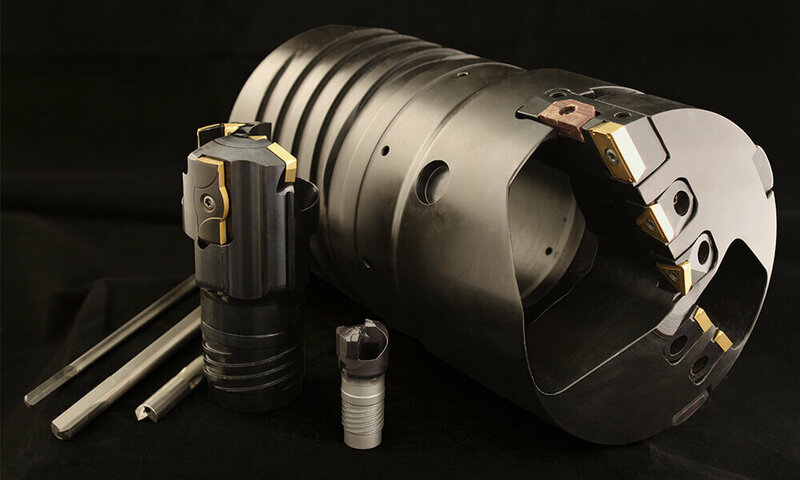 A tool that performs two options in one pass – stock removal skiving, and cold working roller burnishing – to finish the inside diameter of a tube, typically used in hydraulic cylinder applications. A gundrill tip configuration where certain geometric features are blended to create chip clearance and coolant relief. A cam fixture is used to generate the sweeping geometry, and the primary features are adjusted as needed for different materials. A tool that is used to drill a deep hole into solid material, by cutting a larger diameter and leaving a solid core in the middle, on machines equipped for the BTA process. An assembly consisting of a housing and bearing that mounts in a gundrilling machine, which holds a whip guide insert. The outside diameter of the housing is common for a machine type. The bearing size is selected based on the whip guide insert size compatible with a specific gundrill. A small plastic component that is fitted within the whip guide adapter, and tightly supports gundrills and small BTA drill tubes for reduced tool whip and vibration, and improved hole accuracy.